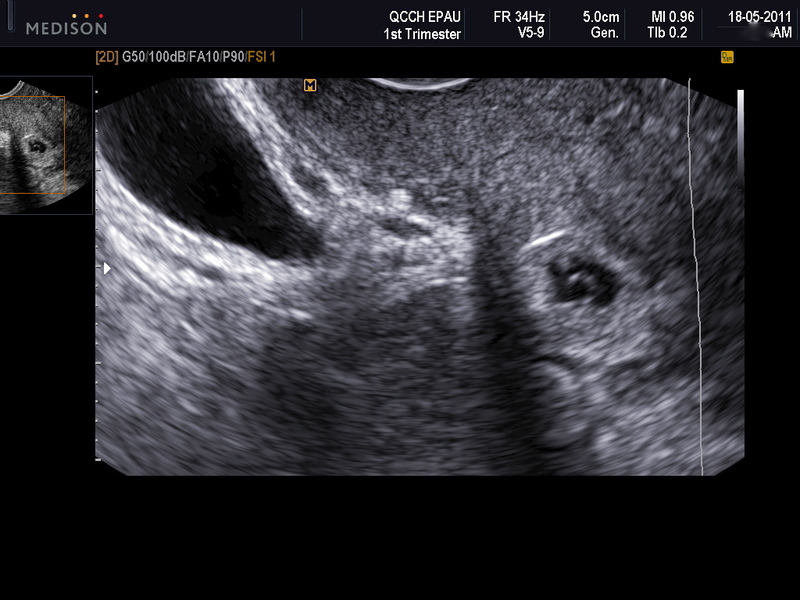 ← How are tubal ectopic pregnancies treated? Caesarean section scar ectopic pregnancies – an increasing problem? An ectopic pregnancy is when a pregnancy develops outside the cavity of the womb. These pregnancies are usually found in the Fallopian tube, but an important minority are located in “non-tubal” places. Examples are the interstitial tube where the tube passes through the muscle of the uterus, the cervix and more rarely in the wall of the uterus itself (myometrial). These pregnancies matter as they often cause problems quite late on, and are associated with a disproportionate number of serious complications. One type of ectopic pregnancy that we seem to be seeing increasingly is where the pregnancy is implanted in the scar left in the uterus following a caesaean section. The evidence suggests that these pregnancies if they continue will be associated with the placenta becoming deeply implanted into the scar and often through the scar into the space between the uterus and the bladder. If the pregnancy survives the placenta then fails to come away at delivery and there is a very high risk of severe bleeding, needing a hysterectomy to control bleeding or worse. Early in the pregnancy these scar pregnancies may also bleed heavily. In view of these serious problems if a scar pregnancy is diagnosied a patient will usually be advised that the pregnancy should not continue (though often it will fail in any event and may consist of only placental tissue. For the pregnant women this is a terribly difficult situation. As doctors we tend to talk about “treating or managing” caesarean section ectopic pregnancy, for the women it does not feel like that at all. The optimal way to treat these is not established as there are no good comparative studies to be guided by. In the UK a consensus seems to be developing – based largely on the experience of Davor Jurkovic and his group at UCL in London. If diagnosed very early, then similar surgery to when we treat a miscarriage is safe. This involved introducing a small suction catheter into the womb and removing the pregnancy (which is usually only placental tissue that is growing). This is usually carried out under ultrasound guidance under an anasethetic in the operating theatre. This entry was posted in Diagnosis, Diagnosis and treatment, Media stories and tagged caesarean section, ectopic, ectopic pregnancy, Ultrasound. Bookmark the permalink.